BRANFORD — Ginway Lin has helped run his family’s China Pavilion restaurant in Orange for 15 years and thought, “This isn’t that hard,” when he made his decision to go solo. Today, a month after opening his own 9 East Asian Hibachi and Kitchen in Branford, Lin clearly sees the difference between joining an established business and starting one. “They (at China Pavilion) set the bar high and the place was like a well-oiled machine,” said Lin, who now appreciates all the work it takes to establish a clientele, build a staff and tend to every detail. But Lin, 38, now working 15 hours a day, seven days a week, alongside his wife, Irene Wang, 31, said he loves the challenge. Lin brings with him two of the most important rules he learned from his uncle Danny Lin, an owner and chef of the popular Orange eatery: “You have to treat people like they’re guests in your own home,” and keep a spotless, organized kitchen. Ginway Lin, who is still part owner of China Pavilion, along with his cousin, Fred Peng, said customers at the Orange restaurant — who travel from as far away as the Shoreline — encouraged him to open a restaurant in the Branford area, where Lin believes more top-notch Asian food is needed. So he crafted one that uniquely offers hibachi (cooking on integrated tabletop grills), a sushi bar and authentic Japanese and Chinese dishes from an Asian kitchen, hiring specialty chefs in all areas. The poor economy wasn’t too much of a consideration, Lin said, because he believes a great product at reasonable prices will always draw customers. That product, he believes, includes superb food at reasonable prices and atmosphere — the latter being as much a specialty at 9 East as the Chilean seabass miso yaki. Lin, a former architectural student who was key in China Pavilion’s redesign a few years ago, went for a trendy Manhattan-style look with an Asian feel. “It’s a very Zen feeling, like a Manhattan-style restaurant — who can go to Manhattan every week?” he said. A waterfall behind a giant Buddha that is a focal point of the decor soothes and relaxes guests, as koi fish symbolizing love and friendship swim at the base and through a channel in the floor. Tiny lights against a dark ceiling make it feel like diners are eating under the stars, and at every turn is a new and soothing sight for the senses, including bamboo, sculptures and even a custom-made beaded curtain that separates a private dining area for a party of up to 16. The restaurant is spacious. 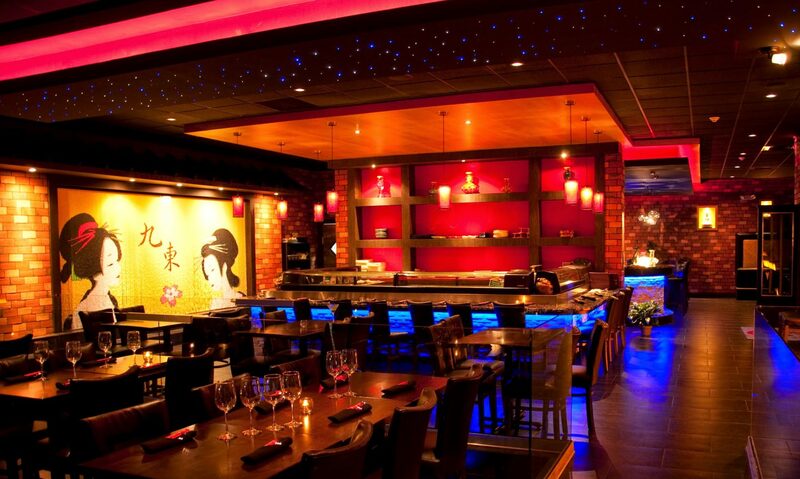 After an hour at 9 East Asian Hibachi and Kitchen, it’s easy to forget the outside world. Before dark, the main street is visible through a large front window, like a movie running in another reality. Despite the economy, clientele at the restaurant, 310 East Main St., is building fast. 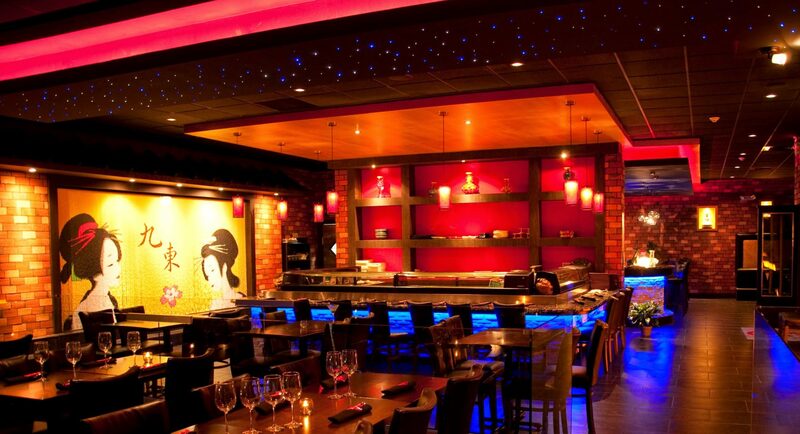 Reservations are suggested weekends for a seat at the wildly popular hibachi grills. 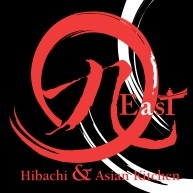 Lin, who is still learning about hibachi himself, said it’s popular because customers like to see their food being cooked — and each hibachi chef brings an entertainment spin to the grill.The food at 9 East is as fresh and tasty as it gets. As a couple, Lin and Wang have never spent as much time together — a mixed bag, both admit. Wang, who has no restaurant experience and worked as a special education teacher in Taiwan before coming to the United States eight years ago, said the business is harder than she thought. Before the restaurant opened, Wang stayed home with their two children, 5 and 3. Now the kids are cared for by the couple’s parents, who came from Taiwan to help. “It’s harder than we thought because we’re starting from the beginning,” Wang said. Lin said it’s been tough on the family, but the hard work is ultimately for their benefit. Lin doesn’t have to go far to check out the “competition” — as he and Wang live in Orange with his uncle and aunt who are part owners of China Pavilion — but said he’s going in so early and leaving so late, he and his relatives barely have time to talk. “I’m always curious how busy they are compared to us,” Lin chuckled, referring to China Pavilion.